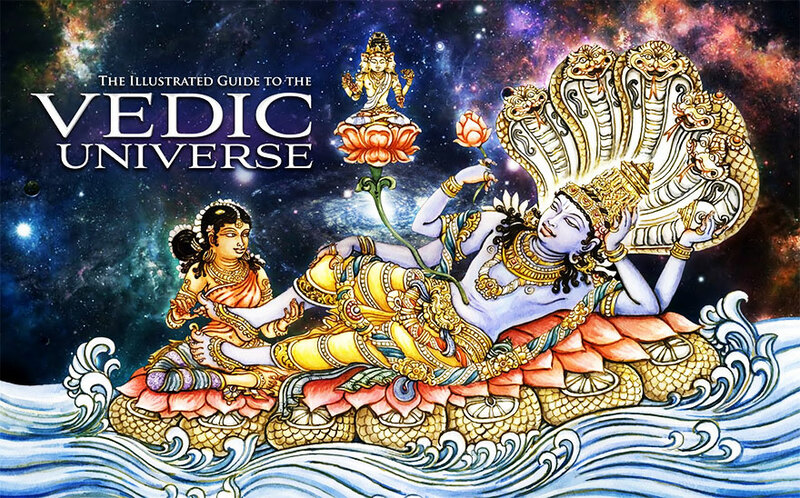 The cosmology and cosmography of the ancient Vedas is awe inspiring to say the least. The more “modern” of the Vedic texts are known to originate from approximately 3000 B.C., thus being the oldest scientific and religious doctrines known to man. The descriptions of our solar system and what modern astronomy has discovered of the visible universe corresponds with the ancient Vedic knowledge, proving that man has had advanced knowledge of astronomy for thousands of years before our modern civilization began. This article describes the Vedic version of planetary systems from the topmost, eternal planets down through the temporary planetary systems within innumerable universes of this material world. When saying “cosmic manifestation” we speak of two separate worlds, the spiritual and the material. The spiritual planetary systems are eternal, beyond the limits of the material universes, and belong to a “super dimensional” or “anti-material” dimension. These are beyond the limitations of material time and space and therefore beyond our vision, or powers of perception. In these planetary systems there is no occurrence of creation or dissolution, and these planets are unlimited, indestructible, and eternally existing. There are descriptions of these spiritual planets in the vedic literatures, but this article concentrates on those within the material universe. The material planetary systems are created at some point in time and will be destroyed at another. They are bound by the influences of time and space. Both of these energies (spiritual and material) are of the same divine source called “brahmajyoti”, the spiritual light. About 1/4th of this brahmajyoti is covered by the “mahat-tattva”, the material energy, where are found innumerable material universes. The 3/4th portion is the eternal spiritual sky. In the spiritual world are two realms of existence, “Goloka-dhama” and “Hari-dhama”. The material world has one realm called “Devi-dhama”. Goloka-dhama is the topmost planet and residence of the Supreme Godhead Sri Sri Radha-Krishna. Below this is Hari-dhama where the spiritual planets of the Vaikunthalokas are situated. Below the Vaikuntha planets is “Mahesh-dhama” (also called Sadasivaloka, or the abode of Lord Siva). This is the realm dividing the spiritual from the material universes. Below Mahesh-dhama is Devi-dhama, the realm of the material universe. It is said that the systems of yoga offer different destinations. Bhakti yoga directs one toward entering Hari-dhama or Goloka-dhama. Jnana yoga directs the aspirant toward entrance to Mahesh dhama, and karma yoga directs one to remain in Devi-dhama, experiencing repeated birth and death in the material worlds. In the Bhagavad-Gita we find a statement that there are three divisions of material planets in our universe. They are “urdhva-loka” (highest), “madhya-loka” (middle), and “adho-loka” (lower). Above the urdhva-lokas are the coverings of the material universe beyond which lie the eternal realms of existence. Within these three spheres of existence are 14 main planetary systems with different standards of life and duration of existence. The residents of the upper three systems have almost no disease or aging of the body, and they have no sense of fear. As the planetary systems progress downward there is lesser duration of life and standard of living, as well as a greater manifestation of disease and anxiety. The term “amara” (deathless) is often used to describe the residents of the heavenly planets because their span of life is inconceivable to us, but although they live for millions of years by our calculation, none within the material worlds can live here eternally. In Bhagavad-Gita there is given a description for the life span of those living on Satyaloka. One day is equal to 4,300,000,000 solar years. On other heavenly planets the day is considered to equal six months of our time, and the night also equal to six months on earth. These souls live in their bodies for 10 million of their years. Time duration such as day, night, months, and years are different in different planetary systems, and there are also different types of human beings, animals, trees, and vegetation. Some of the planets that are visible to us are considered heavenly planets with different timings. Jupiter, Venus, and the Moon are examples of planets where one day is equal to six months on earth. How can that be, one may ask, when we can see these planets orbiting the Sun? One point of reference that may be difficult for some to understand is crucial to this realization. All planets have different dimensions surrounding them. The dimension of existence visible to our eyes gives us the impression that the other planets in our solar system are mostly devoid of life. In actuality astronomers have found proof of intelligent life on other planets, regardless of the fact that little is yet public knowledge. The purview discernable by our physical eyes, though, cannot enter into the heavenly spheres of these planets where devas, angels, and higher beings exist, nor even that of humans who enjoy an existence far superior to what is obtainable on our planet earth. Just as on and surrounding earth there are realms of existence inhabited by ethereal beings invisible to our eyes, some highly advanced and others bound by unfortunate circumstances (such as ghosts), all planets have different spheres of existence. We can never gain knowledge of the multi-dimensional reality on earth with our physical eyes, so how could we possibly expect to enter into the higher realities of other planets with them? Our minds may balk at such a conception of different types of oceans, but why should any of these be more fantastic than the ocean of salt water that we have here on earth? This planet is called “Dhruvaloka” and we see it as the polestar. It is said to be 3,800,000 yojanas above the sun (one yojana is equal to 8 miles). Above Dhruvaloka by 10,000,000 yojanas is Maharloka. Above Maharloka by 20,000,000 yojanas is Janaloka, a further 80,000,000 yojanas lies Tapaloka, and above by 120,000,000 yojanas is Satyaloka. 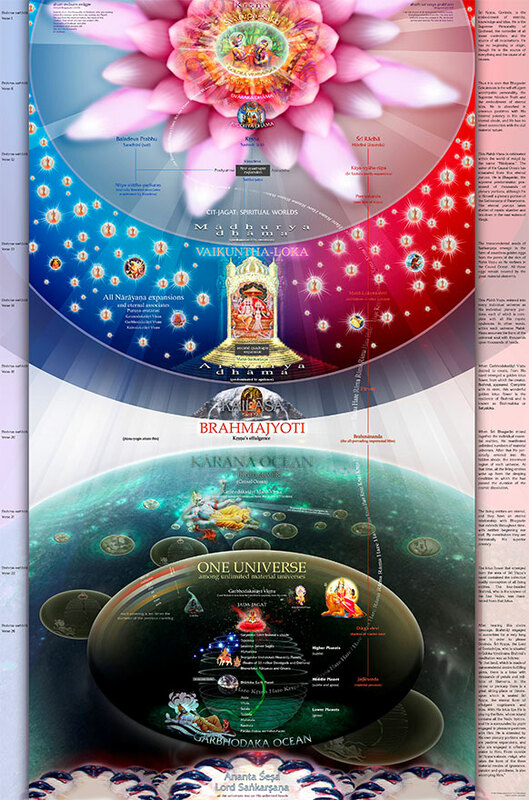 The Vaikuntha planets begin 26,200,000 yojanas beyond Satyaloka. The scripture “Vishnu Purana” describes that the outer covering of the universe begins 260,000,000 yojanas above the sun. About 70,000 yojanas below the earth begin the seven lower planetary systems of Atala, Vitala, Sutala, Talatala, Mahatala, Rasatala, and Patala. Below these planets 30,000 yojanas is the Garbhodaka Ocean where Sesa Naga lies. This ocean is 249,800,000 yojanas deep. This gives an approximate diameter of the universe as 500,000,000 yojanas or 4,000,000,000 miles. These distances are calculated according to the distances between the planetary “planes” of existence. Actual distances between planets may be more. The higher planetary systems are the realms of devas, demigods, and angels. Bhuvarloka is the abode of ghostly spirits, and the lower planets are populated by those of demoniac consciousness as well as the snakes known as “Nagas”. Development of higher consciousness, which also includes advanced intellectuality, starts with human beings and further increases among the denizens of higher planetary systems. The earth is situated close to the middle of these planetary systems. The following are descriptions of the 14 planetary systems in Vedic cosmology. Saturn is considered an inauspicious planet astrologically, as he gives painful lessons to us here on earth. It is situated 1,600,000 miles above Jupiter and passes through one sign of the zodiac every 30 months. Jupiter is considered a most auspicious heavenly planet and is generally considered favorable astrologically, depending on placement at the time of our births here on earth. It is a planet of devas, and situated 1,600,000 miles above Mars. Mars is considered to be a malefic planet, which creates lack of rainfall on earth and almost always is capable of creating unfavorable influences here. It is situated 1,600,000 miles above Mercury. Mercury is said to be the son of the moon and is 1,600,000 miles beyond the planet Venus. As does Venus, he sometimes moves behind the sun, sometimes in front, and sometimes along with it. Generally the influence of Mercury is said to be auspicious astrologically, except when not moving with the sun. At such times this planet causes great storms on earth. Venus is considered a most auspicious and favorable planet, and is also of the heavenly planets. Venus is said to bring rainfall, another reason for it being considered auspicious to life on earth. The Moon is one of the four most important residences of the demigods. Those who worship the demigods through sacrifice aimed at great material enjoyment are promoted to the Moon. Here the celestial, intoxicating beverage called “soma” is available. It is not possible to enter into or even see the actual heavenly dimensions of this planet with our present eyes. The Moon passes through the entire zodiac in approximately one month. He influences the growth of vegetation and therefore considered the life-giver for all living beings on earth. The Sun is the source of light and heat for our universe. Modern science considers many stars to also be suns, but in the vedic literature they are considered to be planets of varying material elements, but not the center, as is the Sun. Surya, the sun god, is considered an expansion of Narayana (a form of Lord Vishnu). He controls the seasons here on earth. It is situated between Bhuloka and Bhuvarloka, rotating through the time circle of the zodiac. Yogis practicing hatha or ashtanga yoga, or those performing agnihotra sacrifices, worship the sun for their benefit. The demigods residing on the sun planet have bodies made of fire, necessary for life here. Rahu is said to be an invisible planet, which is situated 80,000 miles below the sun. It causes solar and lunar eclipses, as Rahu, along with Ketu, are the north and south nodes of the moon respectively. These planets are 80,000 miles below Rahu. The residents of these planets are born with natural mystic powers, including the ability to fly without mechanical means, even to other planets. They have all the mystic siddhis, and being materially perfect beings can control gravity, time, and space. Their arts, culture, and sciences are far superior to that knowledge possessed by we here in the earthly realm. Beneath these higher planetary systems, in the sky called “antariksha”, are the residences of the Yakshas, Rakshashas, Pisachas, ghosts, and other etheral beings. This realm extends as far as the wind blows and clouds float in the sky. Above this there is no air. The planetary systems of middle earth (Bhumandala or Bhuloka) are abodes of both standards of living such as we enjoy on our planet, as well as some heavenly abodes where living beings may “stop” on the way to, or from, births in the heavenly planetary systems. There are seven planetary systems, which are divided by seven oceans. The names of the planetary systems are Jambu, Plaksha, Salmali, Kusha, Krauncha, Shaka, and Pushkara. Each system is twice as large as the one preceding it, and each ocean between the systems are made respectively of salt water, sugarcane juice, liquor, ghee, milk, emulsified yogurt, and sweet water. Bhumandala is shaped like a lotus flower and the seven planetary systems are in the whorl of the lotus. The radius of Bhumandala extends as far as the sunshine, and the limits of our vision here to see the stars and moon. As the sunshine reaches earth from a distance of 93,000,000 miles, this is the radius of the plane of Bhumandala. Below the earth are seven other systems called Atala, Vitala, Sutala, Talatala, Mahatala, Rasatala, and Patala. These lower planetary systems are the same size as the earth planet, and begin 560,000 miles below earth. Sunshine does not reach these planets and light comes from jewels on the hoods of serpents. These planets are populated by persons of great power and opulence, yet of demoniac consciousness, who have reached here through austerity aimed at material enjoyment without spiritual development. They do not become old and diseased and fear only the time factor, which ultimately must destroy their abodes. Therefore they are given the name of “bila-svarga”, or subterranean heavenly planets. The residents here enjoy a standard of material comfort more opulent than even the higher planets due to their desires for high standards of sensual enjoyment, wealth, and influence. The residents are known as Daityas, Danavas, and Nagas and are all engaged in illusory material enjoyment with no thought of spiritual liberation. There are incredible feats of architecture in their cities bedecked with valuable jewels in houses, gardens, compounds, etc. All residents drink juices and bathe in herbal elixirs which free them from any anxiety or physical disease, as well as any sign of physical aging. The visual beauty of these artificial heavens surpasses that of the higher planets and this sensual atmosphere completely captures the mind, allowing no thoughts but those directed toward sensual pleasure and happiness. Since time is not divided into days and nights due to no sunshine reaching these planets, they have no fear produced by time. Only at the time of dissolution does anxiety and fear consume them. Beneath the planet Patalaloka, and slightly above the water of the Garbhodaka ocean, are the Naralokas, or the hellish planetary systems. These planets are of different degrees of suffering for those who must endure life there. Here on earth we can see many hellish circumstances of suffering for people, but nothing like what is experienced on these planets. They are said to be a place of rectification for those who commit the most abominable actions while living as humans on the earthly plane. Although life here seems like it goes on for an eternity, in actual fact the duration of one’s “karmic sentence” here may be only seconds or moments. There are 28 different hellish planets described in the Vedic literatures. These descriptions of the material creation, as well as the spiritual planets, may be found in several Vedic literatures to a far greater depth. I have out of necessity greatly abbreviated the information given here. All of the planetary systems in the material world will in time be annihilated. This annihilation takes place in two ways. Partial annihilation occurs every 4,300,000,000 solar years, or at the end of each day on Satyaloka. This extends from the hellish planets through all lower planetary systems up to the heavenly planets. The highest planets are not annihilated at this time. The entire cosmic manifestation is wound up in the universal form of God every 8,600,000,000 x 30 x 12 x 100 solar years. The spiritual world, which is never annihilated, simply absorbs the material creation. It is described that before the destruction there is no rain for hundreds of years. Everything dries up and dies due to continuous sunshine. The sun becomes 12 times as powerful as was previously. Then there are horrendous rains that absorb everything into water. The mortal bodies of living entities, including all vegetation, merge into the earth. The earth merges into its subtle sensation of fragrance. Fragrance merges into water, and water merges into its quality of taste. That taste merges into fire, which merges into form. Form merges into touch and touch into ether. Ether finally merges into the sensation of sound. The senses all merge into their origins, the presiding devas and demigods, then they merge into the controlling mind, which merges into ego in the mode of goodness. Sound becomes one with ego in the mode of ignorance, and ego (the first of all the physical elements), merges into the total nature. The total material nature dissolves into the modes (goodness, passion, and ignorance). These modes then merge into the unmanifest form of nature, and that unmanifest form merges into time. Time merges into the Supreme Godhead, present as Maha-Vishnu, the original creator of the cosmic manifestation. The origin of all life merges into God, the unborn Supreme Soul who remains one without a second, and from whom all creation and annihilation takes place. This annihilation of the material world is the exact reverse of the process of creation. Everything ultimately rests within the Supreme Absolute. Amazing details of cosmos, unseen. This is made so clear. Thank you. This could undoubtedly be very erudite but for me it is too complicated and lengthy to be understood. You have missed out one. It is Sarvaloka Manidwepa. Srimad Devi bhagavatha maha purana gives the exact same description of the vedic universe as given above. Starting from Golokadham to devi dham but it has one more addition above Golokadham and that is Manidwepa. It is also called as Sarvaloka because it is superior to all other lokas and because it houses everything which can be found in other lokas. It’s the only purana where Vedavyasa has glorified as maha purana at the end of each chapter. No other purana has this type of acknowledgement from the muni. We must open both to material and spiritual cosmology in practical life. How to attain this is important. To be practically with space Raden Ayou Jodjana has done experiments and there you will find practical exercises if you search by her name. embracing all and interpenetrating all form. carrying us on wings of ethereal. that deepest consciousness of pure perfection. threatening us through the perverted consciousness of limitation. intimate, the perfect unity of all things. O Space, thy tenderness is infinite. SIMILARLY TIME IS MOST IMPORTANT PART OF COSMOLOGY WHERE CONSTELLATIONS AND LOKAS EXIST FOR TIME IMMEMORIAL. IN PRACTICAL LIFE, WE ARE LIVING A VERY LIMITED TIME OF THIS BODILY EXISTENCE. I WRITE A FEW LINES AS I FELT ABOUT TIME. We are light of cosmos. We live in Space & Time. Whole cosmos smiles in us. ALL THE TIME, TIME IS ALL. We are movement of moment on times tide. Togetherness and harmony is cardinal law of time, if you inquire. 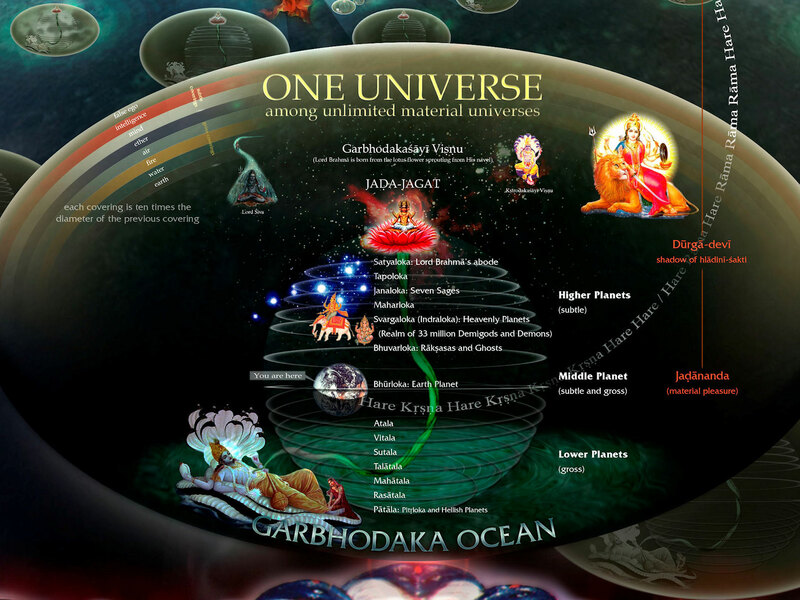 What makes us think that one yojana equals eight miles throughout the universe? Honest question. In Puranas yojana is defined as four times the distance one can hear the cow mooing, or it is otherwise tied to the height of a man. This is certainly not applicable to the distances between planets. Why should we measure distances between visible and invisible things in miles? It’s like measuring the distance between thoughts and paper. Descriptions of the universe in this article assume the same “flat” structure of cosmos as modern science does. By “flat” I mean it’s made of the same kind of matter everywhere placed in the same kind of space. Vedic cosmos, however, is described as a tree with its roots upside down. Tree structure means things grow out of each other, inside out, and they are all of different types – leaves are not the same as roots, for example. Low hanging fruit might be only two meters above the ground but the actual distance from the roots should follow the path through all the successive parts of the tree – trunk and branches. We should also remember that in our view trees are located in that same “flat” space I mentioned earlier but the universe is not in space, space is within the universe, it’s the first created element – ether, and so there’s no “direct” path between fruits and roots, only the path that traverses tree structure itself, and this path describes transformations of one type of matter into another. Desires into thoughts, thoughts into words, words into action, actions into results – like that. In Sankhya it’s morals (perceived by ego)-intelligence-mind-senses-sensations-sense objects. The sages of the upper planets in the universe meditate on varieties of moral values, which they perceive with intelligence, they don’t prefer one moral value over another – that is a function of a mind and it is available on planets in Sisumara system. Preferred values are further divided into senses – like sweetness can be found in taste, smell, smile or sound. This is what is available in heavenly planets. Further division is into sensations for residents of Bhuvar – ghosts are prime example of those who desire sensations but don’t have gross bodies to actualize them in sense objects. Sense objects are created on our Bhu-mandala and this is what modern scientists think the rest of the universe is made of, too, and that’s what makes their universe conceptually flat. Three gunas divide the original morals selected in mahat-tattva (austerity, cleanliness, mercy, and truthfulness) from which our universe is created and which correspond to four heads of Lord Brahma, four Vedas etc. When enough divisions have been made then, by the grace of Vishnu, another type of matter is created, so if, for example, there should be n divisions to create fire from sound then there would n*n divisions to create water from fire and so the “size” of each successive elements in the coverings of the universe is said to be ten time bigger than the previous. The yojanas, therefore measure the transformations, not physical distances between sense objects. Our bodies have corresponding different layers, too. The Moon, for example, could be said to be inside of us as the mind, the desire for sweetness can be then manifest through a particular sense, which is located on a planet controlled by an appropriate deva, and only at the very end it appears as sweet tasting or sweet smelling sense object – what we usually call “gross” matter. Very beautyful nirupan and thanks for good language also. Thank you for the concise but informative article of the Cosmology. It also serves a reminder to us human beings to expand from the self to the universal. It is true the universe cannot be described as “flat” one cannot measure in Yojanas as if one planet is above another. To view the universe this way is misleading the egotistic mind, already a sensual organ. But for the sake of our limited intelligence lord Vedavyasa was instructed to write the Purana’s in this way from the Supreme Source (Atman: Sat Chid Ananda). Further to my comment about a “flat” or classical view of the universe, perhaps this model will explain better. If you remember when reading the Puranas the Devas connect with other Devas or Mahadevas by just though (vritties). Then at the speed of the mind one is transported there. Distance is not a problem. The universe follows the physical laws of Quantum Mechanics. Particles appear and disappear at random. But by the will Icchasakti of the Divine Mind there is order. Like a vegetable soup when you look for a carrot in the soup you spoon it up. But if not mouthed could you find that particular carrot piece again? And the same holds true for all the pieces of vegetables in the soup. The universe is like that soup but of planets . You join beings on chosen planets by the meditative mind, if a mortal being, or by Divine will if otherwise. Then you get “beamed-up” at the speed of the mind and distance, space or time is immaterial. Everything is controlled by the Divine Mind (Rita). One planets location, what is below, what is above to another, does not matter. Help. I need a siddha. My glass of water spilled and the god girl hates me. I am just a child challenged to endure at this stage in living. I do not consider being dead. I am and once loved caused by sat chit ananda. I what can you or I possibly do. I hope you understand me I urge you all to be of the good wish. Thank you. God blest you. It’s easier than continually God bless you. Minor point – the universe doesn’t follow the laws of Quantum Mechanics, it follows laws set by God. In QM particles appear and disappear at random because quantum theory does not recognize existence of karma. Karma commands which possibility must be turned into “reality”, and without accepting input of karma quantum world remains uncertain. Quantum theory doesn’t have the law to remove this uncertainty but God does, and therefore he rules the universe and quantum physicists just stand there trying to make sense of it all, and they can’t.